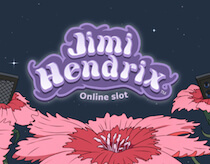 Take a neon-edged trip back to the 1960’s and hook up with legendary Rock guitarist Jimi Hendrix, in this superb slot machine celebration of one of music’s true characters. They don’t come much bigger than Jimi Hendrix. This guitar legend went on to inspire a generation of rockers and heavy metal axemen, who summoned up the spirit of the 1960’s Voodoo Chile. Strike up a chord and strum your way to a load of wins on this commemorative slot machine, which has the power to amplify your wins to some truly electric levels. Video slot presentation featuring 5 reels, 3 rows and 20 fixed pay-lines. Jimi Hendrix gives you 20 fixed pay-lines on which to make your bets. Use the COIN VALUE to increment the coin size used to play this slot game. The LEVEL function to assign between 1-10 coins to each of the game’s 20 fixed pay-lines. Start a game at the highest possible LEVEL with your current COIN VALUE by hitting the MAX BET button. The SPIN button starts a game. When all the symbols stop in place certain bonus features are evaluated, then wins are paid, then the feature rounds will trigger. AUTO-PLAY is available on Jimi Hendrix. Land in 4 or more Red Guitar symbols to start the Red Guitar respin bonus, with chances for reactivation. Hit the Purple Haze symbol on reel one to transform all the royal symbols on the grid into wild symbols. Land in 3 scatter symbols to start the pick and click feature, giving you access to a straight up cash prize and three different bonus free spin rounds. Each free spin round gives you a range of free spins with extra wild mechanisms to help you land the biggest wins.